Among the various indicators which reflect a country's relative global position, the most dismal status in India possibly relates to sanitation. India accounts for almost 60 per cent of the world’s population which defecates in the open. Although an emerging economic colossus, it is dwarfed even by its smaller and poorer South Asian neighbours on the account of their sanitary health. The announcement by the Prime Minister—soon after he came to power in 2014—to make India Open Defecation Free (ODF) as one of the foremost goals of his government was, thus, a welcome move. Since then, 16 districts have been declared ODF and some 22 million toilets constructed. This is against a deficit of some 111 million households. Another 100 odd districts have been identified in the first phase as possible ODF declarations in the current financial year. Over Rs 18,000 crore have been spent under the Swachh Bharat Mission (SBM) since its launch in October, 2014. The Swachh Bharat Kosh-which seeks to attract the participation of the private sector-has reportedly received Rs 400 crore to aid this national goal. However, SBM is likely to fall short of its target of universal toilet coverage by 2019. More worrying is the possibility that it can end like a similar scheme started in the past. A rural sanitation revolution--marked by a massive spurt in total construction--was a much touted success in the first decade of this century. Then the 2011 census delivered a stunning blow. In the preceding 10 years, rural households with toilets increased by just 9 per cent, even as toilets had reportedly been constructed in more than 70 per cent of rural households. On the urban side, visible open defecation (OD) is said to be practiced by only 13 per cent of the population and this is the segment to which SBM (G) is devoting its attention. The problem is in what SBM (urban) does not focus on. A subsidy-based toilet construction programme, it does not target on fixing the existing missing links. For instance, safe disposal of human waste in urban India is worse than in rural India. Be it sewage treatment or management of faecal sludge from stand alone toilets, the required infrastructure either does not exist or if created, has seldom delivered. So is there nothing about SBM which can make a difference, other than the high profile bestowed by Prime Ministerial interest? Well, it is better packaged, there is more visibility and the goal of an ODF India is more evocative. It refines the strategy of Nirmal Bharat Abhiyan (NBA), espoused in the dying years of the UPA. The construction of toilets is expected to trigger a collective behavioral change through the Community Led Total Sanitation (CLTS) approach. This will ensure usage. Besides, it is believed this a government which works, unlike the corrupt and tired 'ancient regime' that preceded it. Yet there is cynicism about SBM in many quarters. This is because the policy and approach behind it ignores a fundamental pre-requisite to ensure sustainable results through CLTS. SBM seeks to simply adopt tools without bothering to provide an environment which enables CLTS to succeed. CLTS has time and again demonstrated that collective behavior change is a function of empowered communities which analyse their behavior and act on their own to effect change. Any attempt to spoon feed from above and construct or assist in constructing toilets as a private good brings about a fatal dilution of this principle. This conveys that toilets are being sought, not the collective behavior change essential to secure sanitation as a public good. Secondly, the insidious message is that toilets are desired by someone external to the community and therefore, are required to solve 'their' problem and not that of the community. Thirdly, the real focus of the implementation is on showing toilets and the expenditure to be reported on toilet-based subsidies. As a result, usage on community scale becomes its immediate casualty. The current verification system which seeks the uploading of toilet photos (for beneficiary payments to be reimbursed) reinforces this focus on toilets instead of behavior change. So the presence of toilets becomes the measurable proxy for sanitation, which the Centre uses to disburse funds and states find easiest to deliver. The rural landscape in India is littered with failed attempts to trigger communities and then handout toilets. We seem to be preparing for a repeat on a grander scale. In all its likelihood, we are headed for more toilets than ever before and yet little change in the extent to which ODF environments are actually created. The clear message from past experience (both in India and abroad) is to avoid toilet subsidies since they detract from behavior change. But in our subsidy imbued political economy, the legacy of toilet subsidies is not only seen as necessary but that which should be enhanced every few years. Explicit withdrawal of such a subsidy would immediately invite an anti-poor label for the government. The ideal solution is to leave sanitation to the states and local bodies and not have a central programme at all. After the increase in untied devolution following the recommendations of the 14th Finance Commission, states have enough funds to spend on any function they prioritise. However, this would run counter to a situation in which the Centre needs to show that it is driving the sanitation agenda. The next best option is a Central programme which does two things. First, the Centre should not prescribe how toilet funds are spent and let states choose their own approach. Second, it should focus on outcomes and thus, reward states which perform better. This will incentivise them to adopt policies that deliver better sanitation and not just toilets which become derelict or at best are partially used. However, a Central programme that only rewards states would also run counter to the prevalent mindset in political-bureaucrat circles. Even so, the Centre appears to have understood the rationale of what works and so brought in a radical change in sanitation policy. It has introduced flexibility in the SBM guidelines. States have the option of disbursing subsidies in any manner they choose (such as community rewards) in order to achieve an ODF environment. At the same time, the Centre has negotiated a 1.5 billion dollar World Bank loan to reward performing states. Unfortunately, these excellent initiatives are being compromised by a countervailing set of moves. Instead of conveying the message that sanitation is a responsibility of empowered states, local bodies and communities, Central actions are conveying the opposite. Not only is the SBM viewed as the Centre’s programme, even the mantle for its implementation has been donned by the concerned central Ministry. It is setting its sights on district level achievement and engaging with district administrators directly. Their viewpoint seems to be that since many states are not showing sufficient interest in sanitation, this approach will help deliver results. This has a number of adverse fallouts. The age-old problem of principal-agent relations spawned by Centre sponsored schemes comes to the fore in sanitation. States end up feeling little responsibility for delivering outcomes and are accountable only for doing what the Centre asks them to. For all its protests to the contrary, the Centre has ended up prescribing the mode of implementation. 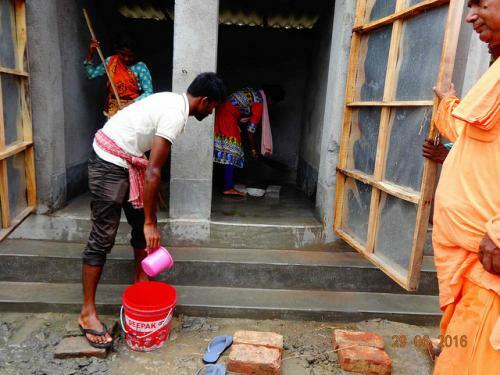 In the current context, this has come to mean - use CLTS-based triggering techniques, follow up with toilet construction and then a monitoring and verification process that ends up relying on toilet count. States and districts have no incentive to capitalise on the flexibility afforded in the SBM guidelines and seek an alternative to the subsidy-based toilet construction programme which is easiest to implement. Direct central involvement with the districts means that it loses the ability to critically examine ODF declarations. It becomes an actor responsible for the result and not a judge of the outcome. This can end up putting a question mark on the sustainability of the achievements that will be rewarded through the World Bank loan. This is not a far-fetched possibility when one considers the manner in which the Ministry developed a vested interest in more Nirmal Gram Puruskar declarations (based on toilet count and not usage) just a few years ago. The twin pillars are in place, namely flexibility on subsidy in the guidelines and an outcome-based reward scheme. Even now, if the Ministry reorients its own behavior and positions itself as a facilitator, judge and regulator of a programme implemented by states, a turnaround is possible. This requires the Centre to not do these - set district targets, talk directly to district administrators and advocate a particular approach. Instead, the Centre must facilitate even more the exercise of choice by states, examine the ODF district claims critically and disseminate information to them. Annual surveys which reward genuine performance and not a mere toilet chase will also help. Above all, ignore the chorus of fawning voices egging on the so-called victories of the toilet construction blitzkrieg. Deepak Sanan is an IAS officer, former Additional Chief Secretary, Government of Himachal Pradesh and advisor to the CLTS Foundation. The views expressed are his own.